This package includes the Enhanced Pearson eText and the print bound book. 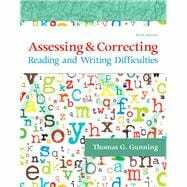 Thomas G. Gunning, a former elementary school reading consultant, junior high English teacher, and secondary school reading specialist, is Professor Emeritus, Southern Connecticut State University, where he has served as department chair and reading clinic director. Gunning has conducted research on group reading inventories, vocabulary assessment, reading disabilities, intervention programs, readability, response to intervention, decoding processes and strategies, and the use of digital technologies to build literacy. Gunning’s other books with Pearson include Creating Literacy Instruction for All Students, 9th Edition; Creating Literacy Instruction for All Students In Grades Pre-k to 4, 2nd Edition; Creating Literacy Instruction for All Students In Grades 4-8, 3rd Edition; Building Literacy in Secondary Content Area Classrooms; Developing Higher-Level Literacy in All Students: Building Reading, Reasoning, and Responding; Closing the Literacy Gap; Phonological Awareness and Primary Phonics; and Building Words: A Resource Manual for Teaching word Analysis and Spelling Strategies .